Book Advertisements for Amar Ujala Instantly! Welcome to Amar Ujala Newspaper Ad Booking Portal. Use this portal to book any Newspaper Ad instantly online for Matrimonial, Property, Recruitment, Public Notice at the lowest rates. Pay via Credit Cards, Debit Cards, UPI, Net Banking or Cheque. Amar Ujala is today India’s third largest daily with a total readership of 30.13 million readers. It primarily covers the states of Uttarakhand, Himachal Pradesh, Jammu, Haryana, Chandigarh, Punjab, Delhi NCR and Uttar Pradesh. This emerging daily’s inception took place at Agra in 1948. Along with the main issue, Amar Ujala also prints Manoranjan, Rupayan and Udaan, which are published weekly. Q. I want to publish a name change ad in Amar Ujala newspaper. Could you please guide me with the ad rates and discount packages? Also, please assist me with the booking process. Why advertise in Amar Ujala Newspaper ? WHY ADVERTISE IN Amar Ujala NEWSPAPER? The newspaper enjoys circulation in seven Indian states, covering nearly 170 districts. Amar Ujala is among the most prestigious newspapers in India, journalistically speaking. The advertising rates of Amar Ujala are rather economical. 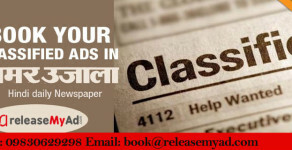 Amar Ujala is a regular broadsheet newspaper with a dedicated ‘Classified’ ads section, under which all display classified ads and text classified are filed. You can also print display ads in any of the other pages of the daily. HOW TO BOOK AD IN Amar Ujala NEWSPAPER? Choose Ad Category & Location - You can choose from Matrimonial, Retail, Business, Property and many more categories. After selecting the suitable category, choose the edition (location specific) you would like to advertise in. Compose your Ad - Compose your ad. You can seek the help of our online sample ad gallery, and also preview how your ad will look on the paper after composition using our Live Preview Ad feature. Select Dates and Clear Payment - After successfully composing your ad, proceed to select dates and clear payment via a host of online and offline methods. Online payment options include Credit Cards, Debit Cards and Net banking, and offline methods are demand drafts, cheques, and, in specific cities, data collection from home. All transactions made on our website are safe, protected by a SSL encryption that helps keep unwanted third parties at bay. Accredited by the Indian Newspaper Society (INS), releaseMyAd is the finest place to book ads in top newspapers such as Amar Ujala. Classified Text: The most basic type of ads in newspaper advertising. These ads are charged on the basis of the number of lines or on the number of words. You can add enhancements such as borders, underlining and coloured backgrounds to make your ad stand out. Classified Display: A hybrid between text and display ads, these ads are charged on the basis of area, have the option of including coloured photographs, images and logos. These ads are printed in the dedicated classified columns. Display Ads: Display ads are the most noticeable ads in newspapers. Display ads are charged by unit area, and can be placed anywhere on the paper. Display ads allow for maximum creative expression. You can upload PDF, JPEG or EPS files when uploading your ad material. Classifieds Ad Sections LocationsFAQ Why AmarUjala?